I am really upset about the plans for parking downtown that I read about in the BIA blog (http://tacomadowntown.blogspot.com/). Not only will this terrible plan affect shoppers negatively (preventing them from coming down town at all because they can park at every neighborhood strip mall for free) but there are quite a few apartments down here that don't have their own parking lots either. My building for example is low-income. These people here can't afford to pay $160 a month for parking in a lot or garage! And what about coming home with groceries? I'm going to have to pay a meter in front of my own front door just so I can unload bags from my car? I can barely afford groceries as it is! I feel like this new plan is ridiculously unfair to those who live, work and try to run business downtown. What about minimum wage employees who work downtown? They'll have to pay $160 a month for parking (or $12-$15 a day) and they might only be part time workers who barely make that much in total! Or what about the small business owner who can't even afford to pay himself a wage. He'll have to pay too so you'll force him about of business. And the 2 hour limits? Don't get me started. No way is that enough time to shop at multiple stores or have a meeting and a lunch. Now the buffer zone goes all the way out to 4th? Someone needs to STOP this from happening. Its a DISASTER!! What are you people thinking? I'm sorry to be so tactless here but I am shocked into near panic about this. Until you create a transit system that goes throughout downtown efficiently, cars and parking are unavoidable. Why are you making it harder for those that are already struggling? This is not better for our city. You may have overcrowding on one part of the city but please don't treat the entire downtown core with one remedy that proves poison for the rest. P.S. I emailed you at info@tacomaparking.com with my comments as suggested by the BIA blog and the message bounced so I'm posting it here in hopes that you will find it and respond to me at angela.jossy@gmail.com. Google tried to deliver your message, but it was rejected by the recipient domain. by KevinFreitas on 5/2/2010 @ 11:53am As their site states the next public meeting is this Thurs. at 5pm in the Pantages lobby. Might be a good idea for anyone opposing these plans to make sure to show up. Might be worthwhile Angie to make sure all the shop owners nearby know. by AngelaJossy on 5/2/2010 @ 11:57am That's the night of my Ruston Business District meeting. They might be upset if their Executive Director didn't show up! :) But I will try to spread the word so maybe enough of them can be present to make some impression on the powers that be. Thanks for the reminder. Nothing you do or say is likely to have any affect on the new parking policies. The inconvenience and expense which you so accurately described are of no concern to the city council. The policy underlying the parking changes is the effort to make people use public transit. by Jesse on 5/2/2010 @ 1:13pm If I were the city, I would have completed 4 more streetcar lines first and then started pay for parking. 1. 13th MLK 11th A st cable car loop. 3. Market to St Helens to Tacoma Ave to Jefferson to Market loop. This way you could park in the outskirts and use transit to get in. You know, cities for walking people, suburbs for cars. post it. email it. put it on posters out your window. have fun! by AngelaJossy on 5/2/2010 @ 5:17pm I particularly love it (sarcasm) how in my part of town (1 hour zone) if you use street parking at night you must move your car by 9 am or else risk getting a ticket. This zone is intended to keep parking clear for shoppers supposedly but none of the businesses open until 11 am. Its easy pickings for the parking nazi's because the only cars that would be there at that hour are the people who live there. by Crenshaw Sepulveda on 5/2/2010 @ 5:46pm This has got to be one of the most stupid things the city of Tacoma has done in a long time. I live on St. Helens, there is never a time during the day that I can't find parking. Even with the construction taking up all kinds of spaces. Sure there are some abuses of the free parking but nothing consistent and regular enforcement of the time limits couldn't fix. If the city is going with this absurd scheme they should at least give out some residential permits for people that actually live downtown to have some sensible parking. I'm like Angela, but I have to move my car by 10 to avoid a ticket. Not a problem a lot of the time but sometimes I do like to work from home without worrying about the parking enforcement. I have to say that most of our downtown parking enforcement people are quite nice and so I will not brow beat them for doing their jobs. I will brow beat Eric Anderson for this absurd and losing proposition. by Erik on 5/2/2010 @ 11:52pm Here is an op edit I wrote from the Tribune a few years ago on regulating parking. The only issue is what is the current occupancy rate. If there is already a 15 percent vacancy rate in an area, the right price for on-street parking is zero. Thus, there certainly should be a cost for parking on Pacific Avenue by UWT. However, the area around the north end of Pacific Avenue often has a vacancy in excess of 15 percent. Few issues concerning downtown Tacoma evoke as much passion and varied opinions as parking. Due to the economic downturn, Tacoma removed its parking meters in 1976. The city briefly considered installing pay stations and implementing an assortment of other parking proposals in 2003 but ultimately shelved the idea due to community opposition. Downtown merchants and other stakeholders are now considering the conditions under which charging for on-street parking would be beneficial and when they would be potentially harmful. Fortunately, Tacoma need not re-invent the wheel for managing on-street parking and implementing the best practices available as many cities have previously faced these issues. One of the leading authorities, which incorporates hundreds of parking studies is the comprehensive text: The High Price of Free Parking written by UCLA professor Donald C. Shoup (2004) and published by the American Planning Association. Shoup is head and shoulders the most recognized parking authority in the United States. With refreshing clarity, Shoup explains that [t]he purpose of right-priced curb parking is not to gouge drivers or to maximize revenue. Instead, the right price is the lowest price that will avoid shortages. In order to avoid such shortages, Shoup reflects that �[t]raffic engineers usually recommend that about 15 percent of curb space-one space every seven-should remain vacant to ensure easy ingress and egress. Shoup explains that unless 15 percent of on-street parking spaces are available in any area of downtown, numerous detrimental consequences occur. First, drivers searching for parking will be unable to easily find an open space, deterring them from visiting or conducting business downtown. Second, an on-street parking shortage causes drivers to cruise the downtown streets seeking a parking spot, circling the block, causing traffic congestion and unwanted pollution. Third, a lack of available on-street parking will cause drivers to double park, attempting to load and unload passengers and cargo while in the roadway, causing yet additional traffic congestion. Of course, charging an amount in excess for parking than is necessary to create a 15 percent vacancy has the unwanted effect of potential visitors people out of the downtown. Thus, overcharging for parking must be avoided as well. Shoups recommendations makes economic sense as a restaurateur with few patrons who doubled his prices would promptly find his restaurant even more vacant. According to the latest data available, downtown Tacoma has an average on-street vacancy rate of 40 percent, nearly three times the desired rate. Consequently, the parking vacancy rate is too high, and the demand insufficient, to place parking meters throughout downtown. However, there may be a number of locations which have sufficient demand so that charging for parking would be a benefit. For instance, the streets surrounding the Pierce County Courthouse, around the UWT, and a block or two on Broadway may have sufficient demand so that charging something for on-street parking would be beneficial. As Tacoma continues to revitalize and create more places to live and work, the demand may later become sufficient so that charging for on-street parking in additional areas of downtown would appropriate. As professor Shoup explains, the method to set the right price for parking is relatively straightforward and is based primarily on the parking demand. Small sections of downtown are each monitored periodically and the parking occupancy rates are recorded. If more than 85 percent of parking spaces in an area are occupied, the price should be increased slightly. If less than 85 percent of the parking spaces are occupied, the price of parking should be lowered slightly (to zero if necessary). The ultimate goal of this policy is to have downtown spaces nearly continuously full yet with approximately one out of seven spaces always available. The process is periodically repeated so that the parking rates will be reflect the demand for parking in a particular area. Another benefit of charging the right price for on-street parking is that the permissible duration of stay downtown can be extended considerably so that a visitor can accomplish more tasks rather than risk receiving a ticket after only 30 minutes or an hour. If all of the stakeholders agree to implement and adhere to the best practices for managing parking in downtown Tacoma, businesses, visitors and other stakeholders will benefit, trust on the issue can be restored, and the downtown will flourish. Erik Bjornson is an attorney in downtown Tacoma who writes about downtown revitalization issues. by Crenshaw Sepulveda on 5/3/2010 @ 12:00am I've watched the video and remain unconvinced. Our parking fee is zero right now and there is no problem finding a place to park downtown. Any time of the day, if I have a car to park, I have no problem finding a place to park on St. Helens. So it seems to me that zero is the proper price to charge for parking in downtown. All day long I work with people that come downtown for various business purposes and they have rarely find it difficult to find a place to park. Maybe on a rainy day they'd like to be a few spaces closer to the door but they certainly have no problem finding a place to park. The two hour parking on Broadway and St. Helens is sufficient to keep a fair number of spaces empty, even with construction going on. People have little enough incentive to come downtown as it is. Why do we want to burden them with fees for parking? by Erik on 5/3/2010 @ 12:07am Our parking fee is zero right now and there is no problem finding a place to park downtown. The crux of the issue is what is the vacancy rate in a particular area? If it is greater than 15 percent, there is a sufficient number of spaces available. If there is less than 15 percent, the price should be increased until there is a 15 percent vacancy. by Crenshaw Sepulveda on 5/3/2010 @ 12:16am I will grant you that the parking around the County City building is insufficient. I'm not certain that putting in parking meters will make much difference in the parking issues there. People need to be at the offices and courts in the County City building, let's face it, the County City is the biggest draw downtown. I suppose if they charge 5 bucks an hour to park around the CC building maybe only the fancy lawyers will be able to pay so they'll have all the parking they want, practically at the front door. Poor people coming in to go to court or visit loved ones in the jail will just have to pack a lunch and walk in from the outlying areas. Sounds like this is a way to build a very elitist parking fee structure. Those with the money are welcome to park up close, the rest can hoof it. by Erik on 5/3/2010 @ 12:21am I will grant you that the parking around the County City building is insufficient. It is. The demand around the County-City Building is one of the highest and the city with vitually ZERO available spaces but has not been designated by the city to have managed/metered parking. by tacoma1 on 5/3/2010 @ 7:43am I whole heartedly agree with Erik on the parking meters. 75 cents/hr is not going to keep me away from the places that I choose to visit downtown. Not having a parking space available will. Tacoman's are way too f'd up in the head regarding their "need" for free parking. As a taxpayer, I already subsidize the roads, and the gas. When people complain that their parking isn't subsidized also, it puts me over the top. Personally, I can't figure out how a minimum wage earner can afford to pay for a car, gas, car maintenance, car payments, and car insurance, let alone pay for parking. When I was just starting out with my first jobs, I took the bus, or road my bike. I couldn't even dream about using a car. Odds are, that the "straw man" car driver that Angela argues for, if they do exist, would forgo the car maintenance and the car insurance. If so, they should be off the road anyways. Besides, there is free parking at the T-Dome transit station, and a free T-link ride. You can still park downtown for free, you just have to work for it a little bit. Residents, who live downtown, should be able to, imo, get a parking permit (for a fee) to park near their residence. by Crenshaw Sepulveda on 5/3/2010 @ 9:36am Everyone should be able to park in front of the business of their choice when they arrive. Kind of like in the movies. Have you ever noticed in the movies no one circles around for parking. There they are, in the middle of San Francisco, Seattle, or NY and they just pull up and park right in front of the fancy restaurant or club they want to go into. Yeah, 300 feet is a lot to walk to your destination from your car. Walking is for suckers. by TacomanTime on 5/3/2010 @ 12:49pm Sarcasm aside, I have no problem walking, riding, crawling? to a destination where I'm going to spend some time. However, when a business does not value my time enough to tell me to park two blocks away & walk in the rain to spend one hour there, it had better have something I really want. by NineInchNachos on 5/3/2010 @ 12:55pm Olympia has parking meters up the yin-yang and it's awesome. I fill that meter up and don't have to worry. by AngelaJossy on 5/3/2010 @ 12:55pm If UWT and The County City Building have parking issues that are effecting commerce (and by commerce I mean sales not the street) then isn't it their responsibility to fix them? Why do the people in low-income housing, the small business owners, the downtown workers and the shoppers have to pay the price for their poor planning? On my end of town I can always find parking on St. Helens, Pacific Ave, Commerce or Broadway. Usually right in front of where I'm going. People down here are loading and unloading antiques many times so they need up front parking and usually get it. Well over 15% vacancy. AND before 11 am and after 5 its a total ghost town on Broadway. Also Mondays the spots are almost completely empty. The only time we have overcrowding is when Pantages has a big show which would be in the evenings mostly when the parking meters are offline. by AngelaJossy on 5/3/2010 @ 2:08pm Tacoma1 said: Personally, I can't figure out how a minimum wage earner can afford to pay for a car, gas, car maintenance, car payments, and car insurance, let alone pay for parking. When I was just starting out with my first jobs, I took the bus, or road my bike. I couldn't even dream about using a car. Odds are, that the "straw man" car driver that Angela argues for, if they do exist, would forgo the car maintenance and the car insurance. If so, they should be off the road anyways. Lest you forget that some people USED to have good jobs and are now forced to take jobs usually held by teenagers. They still need cars in order to survive - whether they can afford the maintenance or not. You expect a 50 year old man to suddenly bike to work? Or a mother of three to take her kids (and all their stuff!) in the rain up hill to a bus stop where they shiver outside for 15-30 minutes? You seem to be above the real world in an ivory tower somewhere. Perhaps the recession has not effected your life the way it has some others who are barely holding on. Some of us never imagined that our college degrees and years of experience would not garner us a living wage. You think being a small business owner makes you wealthy? THINK AGAIN! Its almost worse than minimum wage for some of them right now. We need to hold on to these small businesses though. We need to do everything in our power help them survive. Maybe 75 cents is nothing to you but if your bank account balance was zero and you needed to get to work to change that but couldn't f*cking park your goddamn car in order to get there!! It really does come down to that for some people right now. Some people just aren't in any condition to walk these hills safely - whether for health reason or just age. Some times the weather would render them utterly unpresentable for work once they got there. Would you want your employees to look like sopping messes? Some people are just scared to walk around downtown still. Sure, its better than it used to be but what if you get off work afterdark? See, there are a lot of different angles to this that we could dissect bit by bit but WHY NOW? Is my big question. Huge recession in full force (some say depression) and NOW they decide to charge for parking? Is this REALLY THE RIGHT TIME???? And Erik, thank you for posting that link to Mr. Parking Experts Youtube movie but we are not New York City. Not even close. In my part of town we have well over 15% vacancy and still we are targeted. I wish public transportation was more readily available and easy to use at all hours, I really do. If it were then I wouldn't be saying these things. I would sell my car and walk everywhere unless I needed to carry things, then I would use those little rentable electric cars when I need to go shopping or leave the downtown core for something. by jenyum on 5/3/2010 @ 4:14pm Two blocks away? Seriously, the would be prime parking in any large city. Can't walk two blocks away? In the rain? (Is this some kind of toxic rain?) I get it if there's a mobility issue or you're toting several toddlers but otherwise for crissakes walk a little. That having been said, I recognize the reality that most Tacomans seem to feel that two blocks is an outrageous distance to be parted from ones car and will avoid going to businesses they cannot park directly in front of. Pretty messed up, but that is apparently how we feel here and businesses do take a hit as a result. I also agree that Angie and other downtown residents should be issued resident permits. by TacomanTime on 5/3/2010 @ 5:49pm "for crissakes walk a little... [Tacomans] avoid going to businesses they cannot park directly in front of." Not sure to feel offended or affirmed. Everyone will clearly have their own preferences on how far they will walk based on a variety of conditions - whether they are kids, weather or mobility. It's surprising that you consider my reasons inadequate while making a morality call on others. Is snow acceptable? What if I've got one 10 year old? How about a 4 year old and a 10 year old? I think the reasons are irrelevant. Angela acknowledged that customers need convenient parking for antique businesses and claimed that there was plenty. I shared my own recent experience. I'm just glad you realize that most people who do not live in a major downtown are less willing to walk than those who do. If you want to attract them/me there needs to be convenient parking. They should have solved some transit issues before charging to park. But then again, this is a step toward market rate parking and converting out of all those parking regs. by tacoma1 on 5/4/2010 @ 9:15am btw, slightly off topic, but there was a mention of how miserable waiting for the bus for 15 minutes in the rain is. Recently Pierce Transit implemented real time bus arrival info. It can be accessed via old school phones, smart phones, the web. Now, I typically wait (outside) no longer than 2 or 3 minutes for any bus that I take. Check it out, and if you have smart phone, its a free app. by fredo on 5/4/2010 @ 9:47am transit will never be anything but a marginally acceptable replacement for the family car. If you are married and have children involved in school, after school activities, or have employment which is not located in the vicinity of a transit stop or don't live near a line you can't use transit at all except in an emergency. For people who are unemployed or who live and work along a line transit would probably be OK. Frequently the diesel spewing vehicles trundle around with scarcely any passengers but it's OK because it's "green." But we must all pay to maintain the illusion of transit's "benefit." by Crenshaw Sepulveda on 5/4/2010 @ 11:04am I use that one bus away application on my phone. What a great tool it is. Now if it could help me avoid the Tully's wino, maybe we could put a gps on him and track him along with the buses. by tacoma1 on 5/4/2010 @ 11:50am Fredo, you are a genius. I agree that transit will never replace ambulances. I also agree that transit will never replace cars in the foreseeable future for the vast majority of people. However, transit, if properly funded and implemented, can easily reduce the parking pressure on downtown cores by 20 - 30%, ergo no more parking problems, ergo Angela will no longer have to pay for parking, ergo Angela's parking problem is solved. btw, almost all of Pierce Transit buses run on compressed natural gas, not diesel. The only thing that stands in the way of proper funding is the reluctance of adminstrators to raise fares to the proper level. (Sorry, about the diesel comment. Obviously I'm a bit behind the times technologically) Have a great day tacoma1 I always enjoy your postings. by NineInchNachos on 5/4/2010 @ 12:53pm isn't an ambulance technically a bus? That's socializim. by tacoma1 on 5/4/2010 @ 1:02pm 100% government subsidies on roads and parking is the very definition of socialism. Conservatives for some reason, seem to think otherwise. There are a few blocks downtown that parking meters would make sense on. For the most part though, I never have a problem finding a spot. Why on earth in the middle of the worst economic disaster since the Great Depression would the city be spending millions to install parking meters to then charge the few remaining people downtown - I do not understand. There is a time for doing things - this is not the time to be doing this. Why on earth would you want to charge someone to park downtown AND put a time limit on them? Makes no sense! If someone wants to pay to park on the street all day - let them! by Crenshaw Sepulveda on 5/4/2010 @ 10:43pm morgan, I couldn't have said it better myself. by AngelaJossy on 5/5/2010 @ 9:35pm Morgan, DUDE! Thank you for putting my exact feelings so succinctly! Especially #3! I meant to make that point myself! I could ALMOST get passed the parking meter issue if it meant I could park all day given that I had enough quarters (or money in the bank if its a card reader kind) to make it so I could get stuff done without panic about the parking nazi's. I have work to do! I don't need to be thinking about parking all day long! I hope you are going to that parking meeting at Pantages. I really wish I could be there but I have a very important prior commitment. by L.S.Erhardt on 5/6/2010 @ 12:48am Three things bother me about this. 2) Where do the funds go? The first two are obvious. Time limits, really? If I got the $$$, let me spend it to park all day. But as for the "connector" service, that's a tricky one. The bLink is not bad, if you're willing to park @ the T-Dome station and walk a block or two. It's not too effective if you need to be on 9th & A or 11th & Tacoma Ave. But what I think we need is an RFA kinda like Metro has. 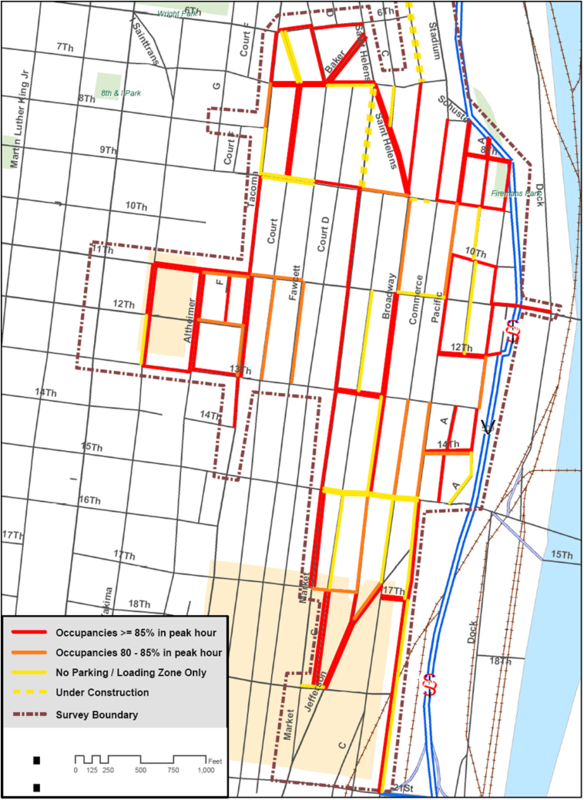 If it was free to ride PT within the downtown boundaries, parking would not only be easier (why park if you don't have to), but it makes you more mobile. Who wants to walk several blocks, especially in wet/cold weather? With an RFA, you could park anywhere in downtown and easily get up the hill or across the area. And ironically, the only times I have issues with parking in the UWT area are well after 8 pm. Since my studio is across from the Swiss, parking is hard to come by most nights of the week. by TacomanTime on 5/7/2010 @ 6:19pm So there was some talk about a meeting this week that AngelaJossy couldn't make it to. Where can I find an update on what was discussed? Doesn't seem to be anything on the city website. by AngelaJossy on 5/7/2010 @ 11:57pm I'd also like to hear from anyone who went to that meeting. Were there any concessions made based on the comments people have been making about this? I heard a short preview of it at the DMG meeting Thursday morning and it seemed that several people there were also apprehensive (to put it mildly) about parking meters. From what I gathered, the meters are coming no matter what but there is a committee to decide how they are implemented and this is why they are holding these public meetings - so we can have input on this. For example they said they were going to recommend changing the hours and not keeping them on as late as 8 pm like they announced previously. They changed this because of public input. Maybe this 2 hour limit could also be changed. I also think residents should get a permit of some sort - especially residents who are living in low income housing. by Chelsea on 5/10/2010 @ 2:59pm Thorax O'Tool: To answer question # 2 Where do the funds go? The ordinance initiating the on-street parking regulations Ordinance # 27840 calls for a "Parking Enterprise Fund" to be created. All revenue generated from the paystations will go into this fund to pay for parking related expenses. by Non Sequitur on 5/10/2010 @ 7:44pm And we believe that? I will be surprised if the monies do not end up in Eric Anderson's wallet. by AngelaJossy on 8/26/2010 @ 1:50pm It did not go unnoticed that the VERY FIRST parking meter was placed at MY doorstep. I'm sure that was just a coincidence though. My city loves me so that could not have been done purposely. Right? by Marty on 8/26/2010 @ 2:42pm The very first meter was put in from ot Paddy Coynes on Monday. I saw it on KIRO TV so it must be true. by fredo on 8/26/2010 @ 2:52pm You downtown merchants and restaurateurs will soon be rich beyond your wildest dreams. I tell you, this is an idea that can't fail. by AngelaJossy on 8/26/2010 @ 3:00pm Yep, like I said, my doorstep. I live in Olympus Hotel, same building as Paddy Coynes. by Altered Chords on 8/26/2010 @ 3:06pm Well Angela, at least you don't have to drive to paddy's and park. by NineInchNachos on 8/26/2010 @ 3:07pm get rid of the retarded 2hr time limit! by Erik on 8/26/2010 @ 4:54pm They are appearing around downtown like a silent army. Don't think they work yet though. It will be interesting to see the occupancy rate of the area after they are in. I hope the city is nimble and willing to lower the price in the lower demand areas like north downtown or the area could be pretty vacant. by morgan on 8/26/2010 @ 5:46pm Considering it's the worst economy in history, is this the best Tacoma can do to help downtown? by tacoma1 on 8/27/2010 @ 12:15am Just saying, Tacoman's have an awful lot of angst 'bout paying 75 cents/hr to park their cars. Meanwhile, Seattle is planning on raking in millions to help pay for improvements to city infrastructure via parking revenues. Hopefully, for the viability of Tacoma, people can be coaxed into leaving their cars at home once in awhile. One thing I love about downtown Seattle, is the vibrancy that's created by having the sidewalks full of people walking everywhere. It's almost impossible to walk around downtown Seattle without 100's if not 1,000's of other people walking nearby. When I'm walking downtown Tacoma, I'm typically one of just a few doing so. Filling Downtown Tacoma with people is what we need to work towards IMO. Having downtown Tacoma full of cars and devoid of people is not what we should be striving for. by fredo on 8/27/2010 @ 7:32am tacoma1, I would suggest that Seattle's vitality occurs in spite of it's expensive parking and not because of it. by morgan on 8/27/2010 @ 7:39am Wow. I can't believe I'm nodding my head in agreement with Fredo! Further, installing parking meters will not turn Tacoma into Seattle. Or Olympia. by tacoma1 on 8/27/2010 @ 9:12am Fredo does have some valid points here............. but assuming he gets his wish (and I hope he does) then DT T Town will start to fill up with people. If all of these new people bring their cars along with them, there just won't be enough room. Down towns and lots of cars don't work well together. Down towns and lots of people with walkable streets works really well. by Crenshaw Sepulveda on 8/27/2010 @ 9:22am Seattle didn't become Seattle by cutting business taxes and commercial property valuations. These are fine things for the recipients of these tax cuts but they will do nothing to make downtown Tacoma into downtown Seattle. People in Tacoma have been sitting on vacant buildings and lots for decades. Through good economies and bad economies the buildings and lots remain vacant. There can only be one Seattle in the region. I'd like to see a solid Tacoma to go along with that. The incentive to develop has to be greater than the incentive to have vacant property. In my view property owners should get breaks if they actually do something with their property. If the property goes from vacant to rented they should receive an incentive, but not for just sitting on vacant property. The failure of downtown Tacoma rests squarely with the property owners. In one posting you applaud Seattle for the millions of dollars it expects to make off parking cars in its downtown area then complain that if downtown Tacoma becomes popular there won't be room to park the cars. Thats called a tradeoff. What do you want, a busy and congested tax producing downtown or a slumbering ghost town where people can park wherever they want even though nobody would want to park there? Like what? could you provide a real world example? by Crenshaw Sepulveda on 8/27/2010 @ 10:13am There are tons of office spaces and store fronts sitting vacant with landlords looking for high rents. Get these spaces rented out and get a tax break from the city. by The Jinxmedic on 8/27/2010 @ 10:14am Um, how about if you have a historic building that you have planned to undergo a full restoration, and the city tears it down against your wishes to make a unneeded parking lot, and then charges you for the demolition- oh wait, that's not a break, is it? Sorry. by fredo on 8/27/2010 @ 10:21am Crenshaw, what specific tax would the city be able to reduce for landlords who are able to rent out their spaces? by Crenshaw Sepulveda on 8/27/2010 @ 12:41pm Any tax that the City has the authority to reduce. by morgan on 8/27/2010 @ 3:13pm Some cities actually tax underutilized properties (ahem, surface parking) at a higher rate than say a 120 story office tower. Some cities also take a proactive approach with slumlords rather than allow demolition by neglect (or city manager). The single most effective thing a property owner can do to protect their building is to keep the roof leak-free. Remember the Eagles building on Fawcett Ave that collapsed a few years back? And of course there's the Luzon. by L.S.Erhardt on 8/27/2010 @ 5:24pm Hmmm... there are no 120 story towers in the US, but I like your idea, Morgan. That really could be a great tool, if we could get our myopic city government to think for once. by Crenshaw Sepulveda on 9/1/2010 @ 9:30am I suspect we'll see plenty of open parking once the meters go in. Of course in my part of downtown there is almost always plenty of open parking except on Farmers Market day. by fredo on 9/1/2010 @ 10:05am In today's economy people can't afford to pay their utility bills, tax bills and mortgages payments, but they'll somehow come up with plenty of money to feed the DT meters and shop at the non-existant businesses. This situation cries out for a cynical comment. Oh, I guess I just provided one. by cisserosmiley on 9/1/2010 @ 12:33pm Paying for downtown parking is a beautiful idea...My biz is up 6th ave where there is no discussion of "pay" parking and it will just draw more and more to "upper" 6th ave. Eventually downtown can go back to the days of the Town Pump Tavern and being able to find a prostitute right on pacific instead of taking a left on Puyallup Ave and driving 2 blocks. Go parking meters! Oh ya...all that data on parking was paid for by development companies, wonder what the GOAL of that data was???????? by L.S.Erhardt on 9/1/2010 @ 3:12pm Sometimes it surprises me that the people of our Fair City haven't taken "counter-measures" against the red light cameras. Perhaps the meters will inspire that? Regardless, not everyone pays to park in Seattle. I avoid it at all costs by either going after 6 for street parking or parking near my friend's condo on First Hill and walking until I get in the RFA. But then again, I'm just cheap. by NineInchNachos on 9/1/2010 @ 3:32pm i'm all for trying something different that what we got now. So can we please dump the 2hr time limits? by L.S.Erhardt on 9/1/2010 @ 3:42pm No kidding. If I have the $ and the desire to spend it, why limit my time? Also, I think it's interesting to note that the meters in Seattle also have a two hour limit. Or, at least the ones by Pike Place and in Belltown & Cap Hill do. by Crenshaw Sepulveda on 9/1/2010 @ 5:03pm the good news about the pay stations is they'll provide some nice surfaces for wheat paste and the like. by AngelaJossy on 9/1/2010 @ 5:40pm I love my parking meter. I'm thinking of painting mine pink with lots of sparkles. I might even put a horn and some wings on it like a pink Pegasus unicorn. by jenyum on 9/1/2010 @ 6:58pm Yeaaah, the time limits are a problem. It costs more per hour to park in the paid lots in town, so you are then penalized for parking longer than two hours. I get that they don't want people to drive, but that's not going to work for everyone.